As I already suspected, Savita didn't survive the dishes =( So this afternoon I tried out another one of the Essence Surfer Babe collection, The World's Coolest. This one I didn't find as nice as the one I already tried (Hang Loose), because if you ain't careful, you pull empty spots in the previous layer(s) while putting on a new layer (is there a name for that?). 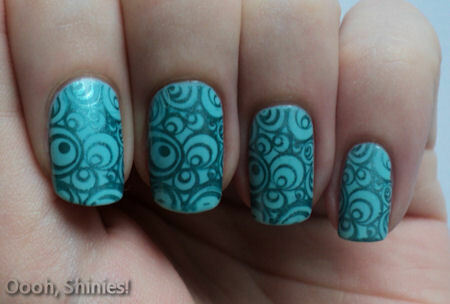 I often find blue and green polishes very pretty, but not so much on my nails :P But this one, however, I do like! The color is a bit in between light blue and green. 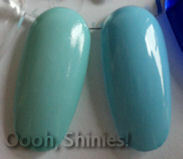 To give you an idea, here it is on a wheel, next to OPI What's With The Cattitude? 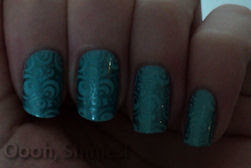 Essence on the left, OPI on the right. The color of the Essence is a lot softer irl than it is on the pictures below, more like it is on the wheel, and I used 3 coats of it. 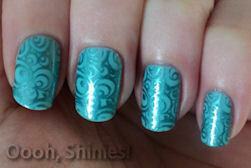 Romantique polishes give a little something extra to a Konad. Sometimes you see it as sharp as you do here, but most of the time it stands out less, as you can see on the other 2 pictures.